August 1, 2013 by C.S. Clarke, Ph.D.
Well, finally, I’m rolling out the first stage of my site redesign for the static part of Superperformance.com. It’s taking forever. I had to update my skills to CSS3 and HTML5 to get the design I wanted to work well. Then, half-way through, I was convinced by friends and other harassers that I needed to make the site flexible and responsive. That is, mobile-friendly. So, I had to learn how to convert my new design and the design of my other sites to become mobile-friendly. But my advisers are right. People want to read articles without having to download an app. I know that I want to be able to search for info I need without having to have an app for a multitude of websites. Why do I need ten apps to read ten different newspapers or magazines. Why can’t I just go to their sites and have their web pages designed to fit my tablet or smartphone? Moreover, I’m changing the focus of my site from merely delivering articles and some e-books to delivering performance and productivity tools. Granted, most of the tools will be for computers, but quite a few will work well — or even better — for mobile devices. 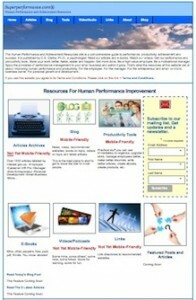 (By “performance and productivity tools” I mean stuff like article templates, résumé templates, video training, video meditation, cheat sheets, checklists and other functional, downloadable or printable products. Yes, quite a bit of them will be free downloadables.) I don’t have much available now, but when I do, I want to deliver them in all the possible ways I can. And, I’ve just put up my first new article in the new format, “Make Your Résumé Work Better,” along with a nice downloadable tool to help with résumé design and formatting.